The Edit button shows/hides the track's editor. The editor shows a graphical representation of the audio signal. A part of it can be selected using the mouse (press left button and drag). The two channels of a stereo track will be displayed separately. Editing just one channel of a stereo track is not possible. At the bottom of the editor the common editor buttons appear (see Common Editor Features). Audio editing is always non-destructive. This means that the file containing the original recording remains unaffected. When an audio file is being edited for the first time a .aem file will be created. This file contains a reference to the original audio file. It can contain references to one or more edit files as well. An edit files replaces a part of the original file. Edit file names look like "trackname - Edit123456.wav", where 123456 is a unique sequence of random characters. Example: Guitar.gjm is being edited. Guitar.aem will be created. A file called "Guitar - Edit123456.wav" will be created (this file contains audio data). Guitar.aem contains information on what files to play when. The files referenced by a .aem file can be viewed in a track's Properties window. Note: Do not delete edit files manually in order to avoid losing edits or punch-in recordings. Use the Clean up Song Folder tool instead. Crossfades are applied automatically in order to avoid clicks. The crossfades behave just like traditional tape splices. The Audio Edit Control, invoked by clicking the Edit button, can be used to manipulate the selected part in various ways. Volume fader: Changes the volume of the selected part. Note: In most cases it is better to use an Automated Fader effect to change volume levels of certain parts of a track, as this leaves the audio file untouched. Fade: Performs a fade in or fade out on the selected part. Reverse: Reverses the select part. 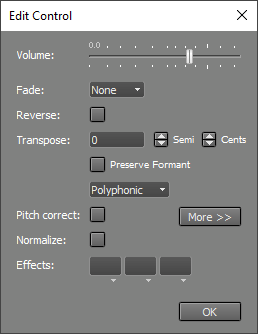 Transpose: Pitch shifts the audio signal by the specified amount of semitones and cents. This features is powered by Zynaptiq's ZTX technology. Preserve Format corrects the formant to make the transposed signal sound like the original (ie. to avoid the 'chipmunk' effect). Two algorithms are available: Polyphonic and Monophonic. If the audio track is monophonic you can switch to Monophonic which is faster and offers better sound quality. The selected algorithm is used for stretching and warping as well. Pitch correction: see Vocal Pitch Correction. Normalize: Makes the selected part as loud as possible. Effect Slots: The Effect Slots can contain effects such as EQ or reverb. Note: Normalizing a file introduces rounding errors and thus compromises sound quality, especially with 16 bit files. Both normalizing individual tracks and normalizing the final mix are bad habits. The Master Limiter effect should be used to make the final mix as loud as possible. Consider a word in a vocal track that's a bit too early. You can select the word (including some surrounding "studio silence") and drag it to the right. Now a piece of silence will appear on the left side of the selected part. This happens because the original word is removed. Better result may be obtained using the Ctrl key (Windows) / Option key (Mac). Now the piece is copied instead of moved, so the original word will stay in place. The result is that the background noise that appears just before the word is repeated once. This usually is less objectionable than plain silence. A part of an audio track can be deleted using the track editor's Delete button. However, it can be more convenient to take advantage of the Tweakable Edit feature: select the part you want to delete, click the Edit button and drag the Volume fader all the way left. Now the part is deleted, and you can fine-tune the edit by dragging and/or resizing the selected part. In critical cases, where the Delete function results in noticeable silence, you can consider pasting a recording of "studio silence" instead of using the Delete function. Sometimes you might want to truncate a file destructively (eg. a master file which appears to be a bit too long), rather than turning it into a .aem file. You can rightclick an audio track's editor and choose "Truncate File" to truncate the file at the mouse position. Note however that this is a destructive operation which cannot be undone. Use a track editor's Export function instead if you feel you don't fully understand this. The editor has a built-in "scrubber", meaning that you can actually hear the part being selected. This can help in finding the desired location, in addition to the visual clues given by the editor. With tape recorders this was done by moving the reels manually ("reel rocking"), now it can be done by moving the mouse. The scrubber is active while moving the needle, while selecting a new part, and while resizing an existing selection. The speed and pitch of the scrubbing sound are determined by the mouse movements. Spectral filtering is applied to avoid damage to loudspeakers or ears by excessive high or sub-low frequency content. This feature can be turned on/off in the Preferences window.